This month, millions of kids around the world will carve a funny face into a pumpkin and place a candle inside to make it glow. The jack-o’-lantern is a Halloween classic – it’s a fun and easy project, and they look awesome! 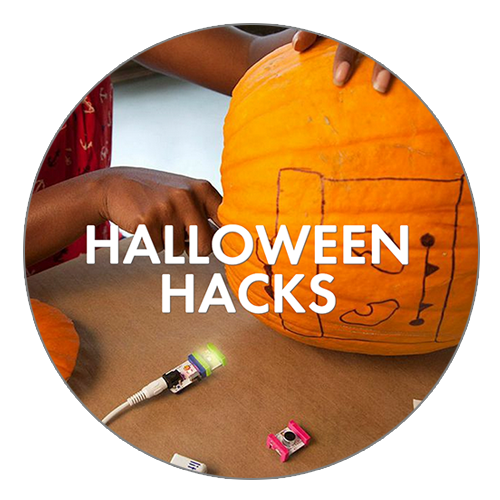 But if you’re looking for a more unique pumpkin decorating project for your classroom, here’s an idea: hack your pumpkin to build a sound-triggered jack-o’-lantern! The company littleBits makes snap-together electronics for kids. This month they are selling a kit that lights up your jack-o’-lantern whenever it hears a loud sound. Can you imagine the reactions this would get as visitors enter your classroom? All you need is a pumpkin, a 9V battery, and littleBits’ sound-triggered kit that you can purchase here for $30. And don’t worry, the electronics don’t go to waste once the Halloween season is over – you can use the snap-together parts with other littleBits kits. For ideas on what to build next, check out the company’s educators blog that has teacher stories showcasing other littleBits classroom projects. There are hundreds of ideas, but this Hack-o-lantern is definitely a fun, festive project to try out this season!